The DEP meeting was held yesterday, Thursday, January 17, at its headquarters in Kanawha City at 2:00 pm. Dozens of citizens concerned about their health and the safety of their water took time out of their days to attend the meeting and question the agency about its seeming reluctance to defend its own proposed rule. Present at the meeting were representatives of the West Virginia Manufacturers Association (WVMA) who, at a November rulemaking review committee meeting, had requested additional time to analyze “new” science they purported to have. They have not offered any new scientific data to the WVDEP, nor did they present any at this listening session. You can find excellent coverage of the meeting here, here, and here. The bill is likely to be taken up in Senate Energy, Industry, and Mining on Tuesday at 1:00 pm in room 208W of the Capitol. 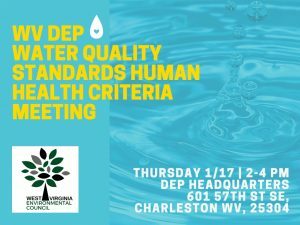 The WVEC lobby team, along with West Virginia Rivers Coalition, and others are working hard inside the building to strengthen the bill, but we need your help. We are fortunate that Chairman Smith pulled the bill last week. We hope that you’ll call and thank him and contact all the members of both the Senate EIM committee and the Senate Judiciary (where the bill will go next) to let them know that you want them to do everything in their power to protect our water and our health! It looks like the “scientific info” is properly cooked and will be handed directly to the proper committees. They keep you out of the loop so you don’t get bothersome.